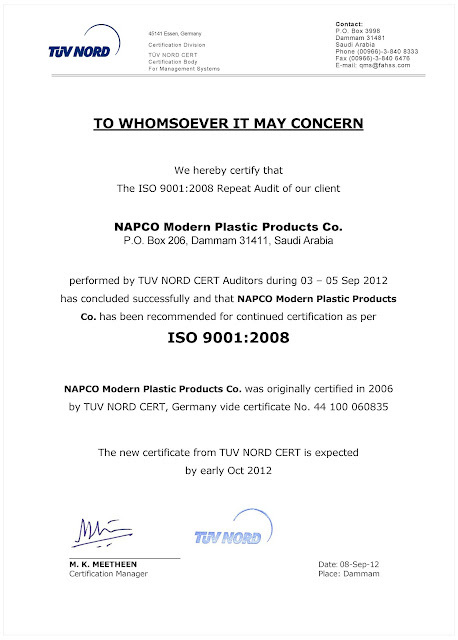 Napco Modern Plastic Products Company –Sack Division passes ISO 9001:2008 repeat audit at Dammam-based plant on 3 – 5 September 2012. Polyethylene (PE) film manufacturer, Napco Modern Plastics Products Company- Sack Division, undergoes and passes ISO 9001:2008 re-audit conducted by Shihab K. Ismail, registered TUV NORD CERT Lead Auditor. The German certification body, TUV NORD CERT, conducted a major inspection of various applied workflows and procedures at all Napco Modern Sack Division departments over the 3-day audit. TUV CERT Lead Auditor commended the data analysis system Napco Modern team implemented through Key Performance Indicators (KPIs) and dashboard analysis. Furthermore, he lauded Napco Modern for setting good analytical tools to precisely acknowledge and pin-point problems to focus on and fix. During the closing meeting, held at Napco Modern’s conference room, Ismail announced the PE manufacturer’s success in the ISO 9001:2008 renewal audit and briefed attendees about observations collected during the audit. 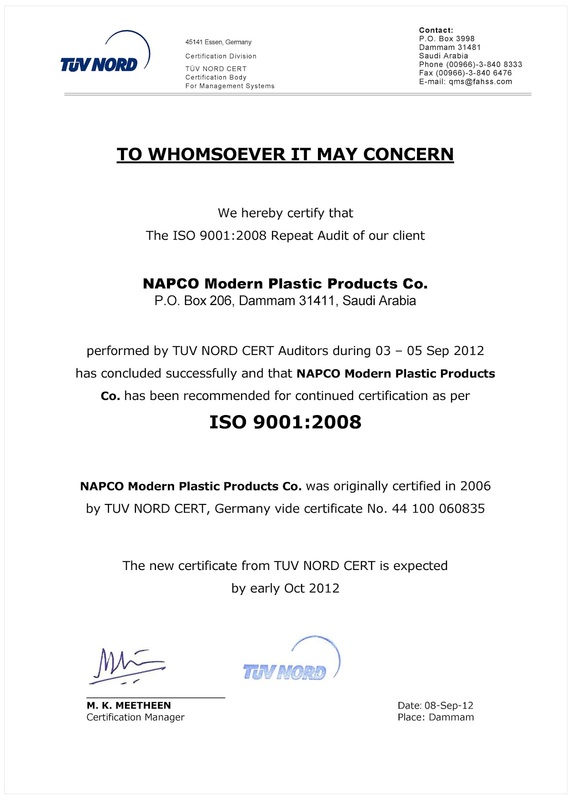 Napco Modern Plastic Products Company Sack Division originally received ISO 9001:2008 certification in 2006 by TUV NORD CERT, Germany vide certificate No. 44 100 060835.